Congratulations to Mrs Shirley Porter of Jackson Close at our Elmbridge Village in Surrey who has won holiday vouchers following our recent inter-village residents’ survey. 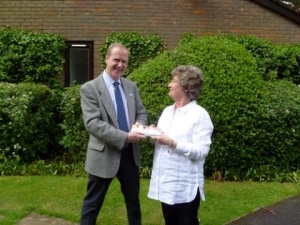 Mrs Porter is pictured receiving the vouchers from Elmbridge Village Manager Simon Baird. The £250-worth of travel vouchers were a token of appreciation from the company to say thank you to every resident who completed and returned our annual survey. While we couldn’t provide everyone with holiday vouchers, we did want to provide a prize for one lucky household and Mrs Porter proved to be the one! “The residents’ survey is important to us,” explained Sarah Burgess, Sales and Marketing Director. “It enables us to benchmark our performance against our residents’ expectations and provides us with real insight into all aspects of our business. This year’s survey forms are now being collated and analysed before being shared with each of our villages.